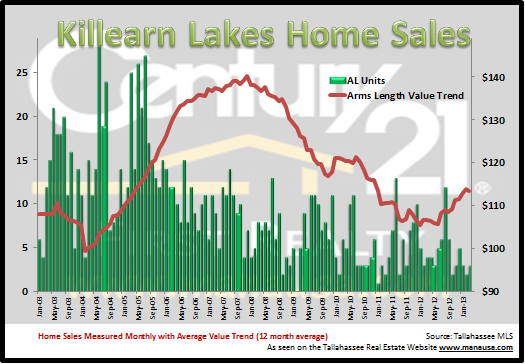 Are Home Values Returning In Killearn Lakes Plantation? The housing market recovery is well underway for homeowners in Killearn Lakes Plantation. When we look at the graph above, we see that unit sales are growing, and 1 in 4 of them are coming from distressed home sales. Currently, there are 49 homes for sale in Killearn Lakes Plantation, and many are priced at levels not seen in nearly 10 years. Killearn Lakes Plantation has been one of the most active neighborhoods in Tallahassee over the past ten years, so anything we see happen here we can expect to find similar trends in other neighborhoods eventually. Average home values are on the rise in Killearn Lakes Plantation, which is very rare for any Tallahassee neighborhood at this point in the recovery. The graph below shows that it is not an insignificant "bump" in the data, rather it is a trend that is nearly a year old. The information shown below is for arms length home sales only, meaning the "averages" would not be as high if we included distressed home sales. I suspect the primary reason for this increase in values is that Killearn Lakes Plantation had seen values drop further than some of the surrounding areas, so Killearn Lakes Plantation is re-aligning with the rest of the housing market. I hope this Killearn Lakes Plantation report has provided you the market insight you were seeking, and you can always drop me a note for a more detailed analysis for your specific goals and situation.